Last night I went to Kushiyu for dinner in Tarzana. I used to go to this place for sushi all the time back in high school, but haven’t been in so long and last night I was craving sushi so decided to finally go back. 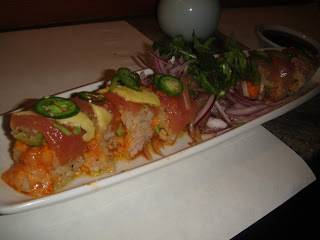 If you live in the valley and like sushi, Kushiyu is a great sushi spot. They have great fresh fish, and not only is their sushi really good, but they are known for their wide variety of barbequed skewers of fresh fish, chicken, vegetables, etc. A little more of an upscale sushi restaurant, but it’s not terribly expensive. Last night I ordered: the Lemon Roll, Spicy Albacore Special Roll, the Asian Roll, Green Roll, Tony Roll, and the seabass skewers. I recommend all three of the above and the spicy tuna on rice cake of course! Seabass Green Roll-garlic ponzu tossed greens on top! Tony Roll- one of my favorites! Lemon Roll w/ seabass skewers…YUM! Great sushi spot in the valley. Definitely recommend it.